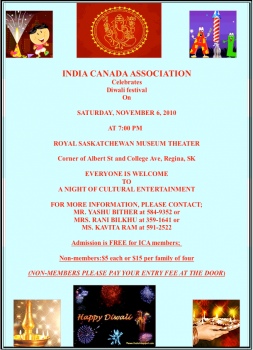 Since the beginning, ICA has hosted a Diwali event – an opportunity for both Indo-Canadians and the great Regina community to celebrate this most important of Indian traditions. ICA Diwali events are an opportunity for families to come together for quality cultural time. We typically hold the party in a community centre and feature music, games, refreshments, and of course, candles and fire crackers.